In 1901, during the closing phases of the South African campaign, there was a requirement for more mounted troops to be mobilized for service. As a result, “L” Squadron, Prince Edward Island Mounted Rifles was organized with a unit strength of fifty-four all ranks and fifty-three horses. This cavalry unit eventually evolved into the Prince Edward Island Light Horse which had supplied soldiers to the war effort for both World Wars, most notably, during the Second World War when it mobilized an armoured squadron that became known as the 2nd Canadian Corps Defence Company. It landed in France on July 6, 1944 and served throughout North-West Europe until the end of the war. In 1904, the Charlottetown Engineer Company was amalgamated with the Artillery. Both the infantry and artillery units that were created in 1875 evolved as a result of their own individual series of amalgamations and redesignations. The Infantry would give rise to units such as the 82nd Abegweit Light Infantry that was instrumental in the formation of the 105th Battalion (CEF) in the First World War. The 82nd would eventually become the PEI Highlanders that would send an entire rifle company, “D” Company, with the North Nova Scotia Highlanders in the Second World War and many other soldiers to the fighting units in both the Italian and Normandy campaigns. 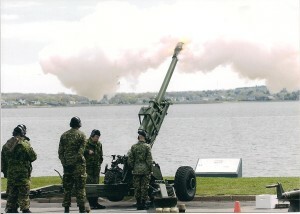 Members of the PEI Regiment firing the ceremonial gun salute on Victoria Day 2014. Reconnaissance Regiment. In 1955, the 28th Light Anti-Aircraft Regiment would be disbanded and amalgamated with The Regiment to form the unit that we know today as The Prince Edward Island Regiment (RCAC). Thousands of Prince Edward Island’s citizens have trained, served, and passed through the ranks of The Regiment and its antecedent units in war and peace, either on the plains of South Africa, through to the fields of Flanders and the beaches of Normandy, to the deserts of Afghanistan, and various peacekeeping missions in between throughout the world. They have also served with distinction on various domestic operations here in Canada and continue to provide a vital connection with Islanders, playing a key role in the official and ceremonial life of Prince Edward Island. Despite the various name changes, amalgamations, and organizational changes, the end result is a reserve army regiment that continues to flourish today by generating, maintaining, and employing a multi-purpose armoured reconnaissance force that is trained for war and ready to deploy on operations as directed. 3 Haviland St, Charlottetown Prince Edward Island ~ Open to the public, Monday – Friday 9:00 am to 4:00 pm, and Thursday evenings from 7:00 pm – 9:00 pm or by appointment.